As you likely already know, visuals are now an essential element of any social media marketing strategy. Initially, long, text-based posts were the primary communications option on Facebook, which were soon replaced with short and spicy messages, ala Twitter. And with the passage of time, and the development of technology, we've seen that shift move towards more visual based content - first images, now video - in accompaniment, and often replacing entirely, text. But despite the rise of social networks, and the changing interactive landscape, there are many companies and brands that are still struggling to generate leads from the medium. But you can stand out with the help of well designed and crafted visuals. Put your efforts into delivering quality over quantity, and users will start recognizing you as an authentic and valuable resource, relevant to their interests. This infographic provides some expert tips to help you to craft and spread visuals across social channels to help boost your fair market share. Click on the image to see the full graphic. 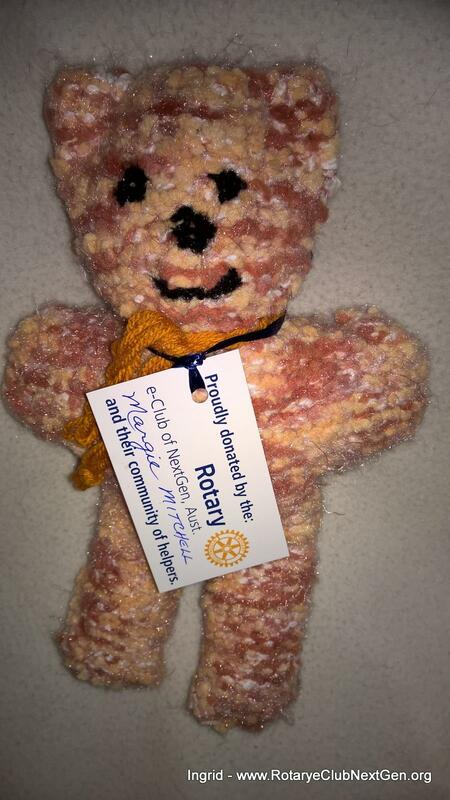 The Rotary e-Club of NextGen has produced special cards to use when they donate items to charities. The reason behind this is that they want their community to be aware that both the Club and the whole community cares and is trying to help. The Club gets donors to write a personal message or their name on the cards to make it more personal for the recipient. It also shows the volunteer that they are a Team and work together. 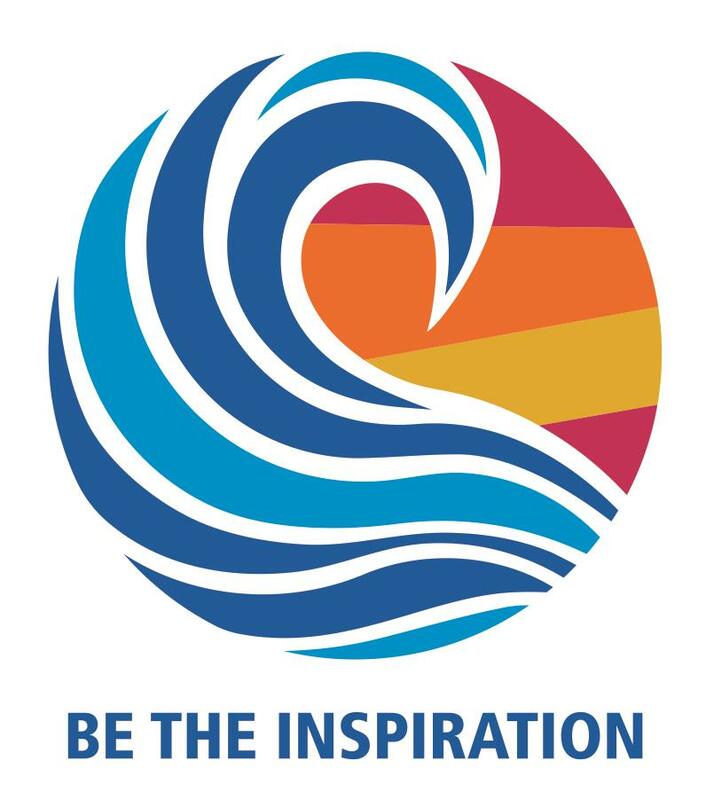 Not everyone is aware of the work Rotary does, and this is a great idea that will spread the good word about Rotary and Clubs. 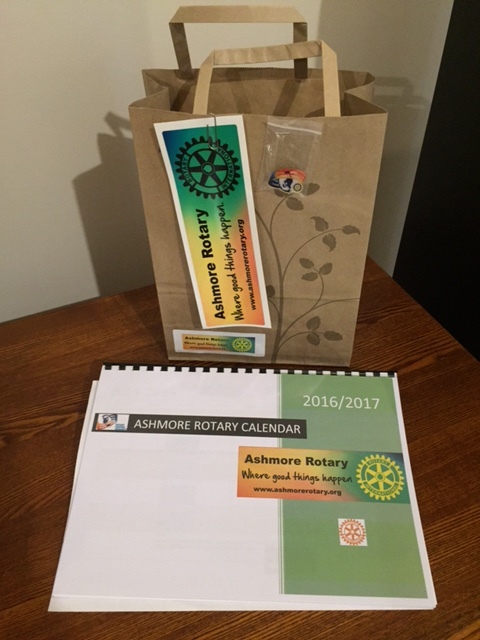 Here's a super innovative idea implemented by President Karen Wibberley of Ashmore Rotary. * a membership booklet with individual photos of members and personal information. The Club calendar is a hard copy format and shows RI monthly themes and who we have as guest speakers, special events, regular projects plus relevant holidays. "Ashmore Rotary - Where good things happen" is Karen's branding for the year. Story dogs are based on the American literacy programme R.E.A.D. (Reading Education Assistance Dogs). Owners with docile and trained dogs help children to learn to read and to concentrate. 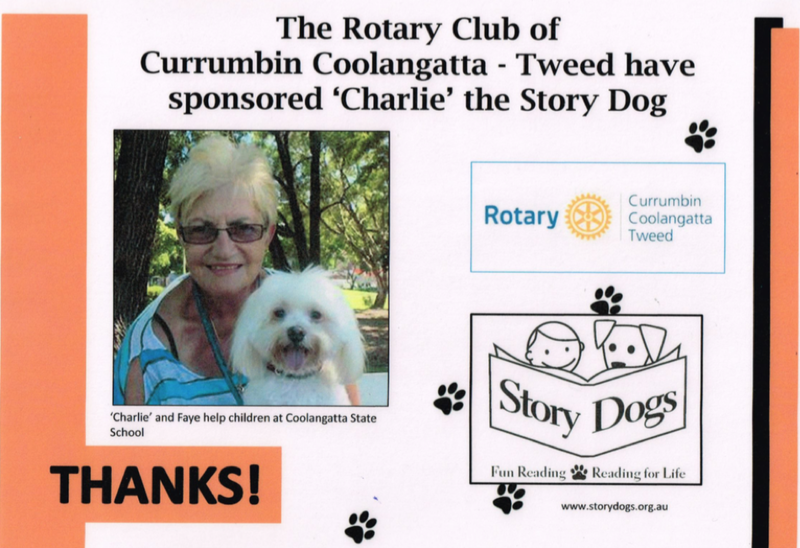 Subsequent to a meeting late last year with the Principal of the Coolangatta State School, it was decided that the Rotary Club of Currumbin-Coolangatta-Tweed Inc. would sponsor $500 to fund a story dog at the school during 2016, with the aim of assisting children with learning difficulties or attention deficits to concentrate while being read stories. We have been lucky to have Faye help with her dog Charlie and, in view of the excellent results, we have informed the school that our Club will be continuing this sponsorship in 2017. More information can be sourced at www.storydogs.org.au. When I joined my Rotary club, I became the thirteenth member of the club. We went along at this number for some time. Later two of our members left, dropping the numbers to eleven. At this time, I became Membership director and after twelve months of operating the promotion I am about to describe, we have increased our membership to 21 individuals. Being from a smaller country town, where human resources for our club were limited, the club and myself decided on a promotional strategy to attract new members. It had been the personal experience of members that a direct approach to the public met with some distrust and rejection, because people were sick of having things sold to them. As a result of this mindset, it was surmised that if people were approaching the club members that a large proportion of this negativity would be eliminated. With this in mind, our idea was to get peoples' attention in a simple way. Hence, the TUIT was invented. It is a simple concept of getting people interested and to get them to make the first verbal contact. We produced round discs with a black background and reverse print to gain maximum visible impact. These were simply printed on a light cardboard on a home printer and cut out. Whenever the members were participating in activities, each member wore one of these tuits pinned to their shirt. Upon noticing the tuit, most people would ask "what is a tuit?". Our immediate response would be "I have already got a round tuit, have you thought about getting a round tu it?" At this stage people either think you are mad, or you have them intrigued. Either way, as a result you have broken the ice with them and are three quarters of the way to inviting them to come to one of your meeting. Depending on the person, we would talk and interact with them on various subjects and inevitably the person would again ask what a tuit is. Again, there is some degree of intuitive feel involved, but normally we would be saying "I have already got a round tuit, I have joined Rotary. 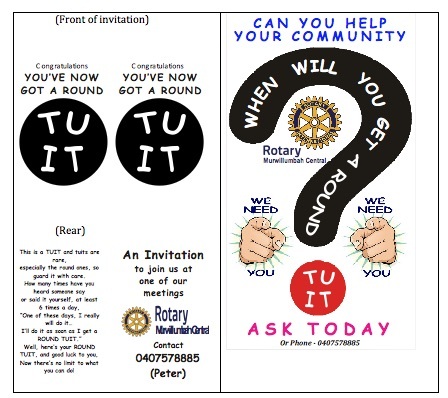 Have you thought about getting a round tuit?" Suddenly the penny drops with them, and they are happy to have been involved with a bit of fun, if nothing else. In our experience, though, a good proportion of these people want more information. The last thing we try to do, is not to be too forceful. We take a very low key approach and give them a professional and personal invitation to our meeting. While in the process of inviting them, we give the person some information about Rotary and the great work the organisation does, as well as letting them know how much fun and interaction with like minded people they can enjoy. These are printed on a home printer and A5 in size then folded in half. The individuals name and contact number are recorded so we can liaise we them along the way. The interest and number of people responding positively was to a degree where to give each individual the best care within our club, we restricted ourselves to having only one or two invitees come along at any given time. Once they attended our meeting, every member became a mentee, mixed socially with them and ensured they were engaged and felt they were the most important person in that room. This gives a basic outline of our promotion and honestly!...it works, and we've had a really great and fun time doing it. The other plusses are that you get to meet some great and interesting people, as well as increase the general awareness of Rotary itself. We are always ready to share and give more information as required, so feel free to contact us if you want more clarification. After all, we are all Rotarians and like-minded people, so we want your club to grow and prosper as well. An idea by Southport RC's Allan Thompson's partner Dee, resulted in 60 needy people within the Southport community enjoying a Christmas lunch...in July. 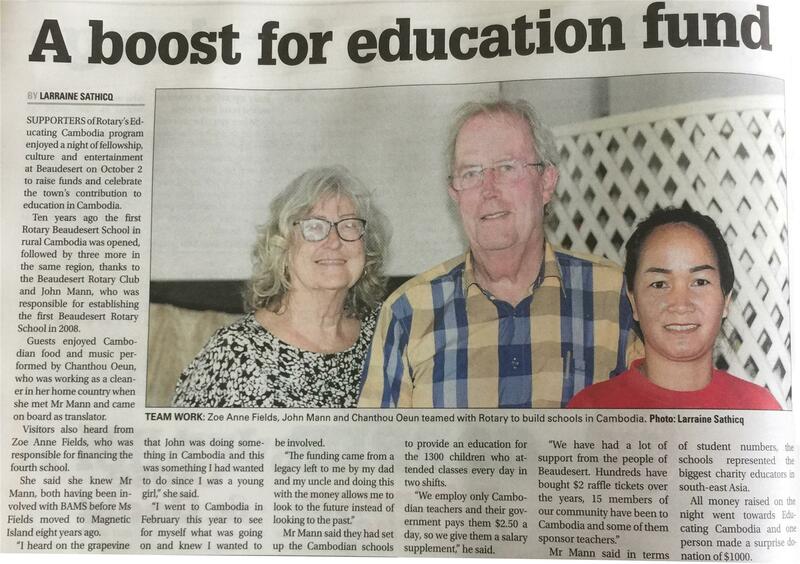 Dee suggested to Allan that a Christmas lunch would be a great thing to do, and Allan then proposed the idea to Southport Rotary Satellite Club Griffith University who jumped at the chance to embark on this project. Four months planning went into the lunch and the project was boosted by a $1000 grant from the Gold Coast Community Group. Some of the food was donated and around 18 Rotarians were on hand to serve the meals. The Club partnered with Set Free Care in Southport who provided a very suitable venue. No formal publicity was needed as word-of-mouth was sufficient to see a long line of people waiting well ahead of when the doors opened. One of the Satellite Clubs members, Jonathan, is the Director of Griffith University's Serotonin Choir who did a 'flash-mob' and sang carols to the diners. Terry, one of the diners, also entertained the group with his impressive rendition of Mary's Boy Child. Orange Sky Laundry was also there and did a wonderful job of washing/drying laundry while the diners ate their Christmas lunch. This event just goes to show how one person's idea can culminate in Rotarians doing good for their community.